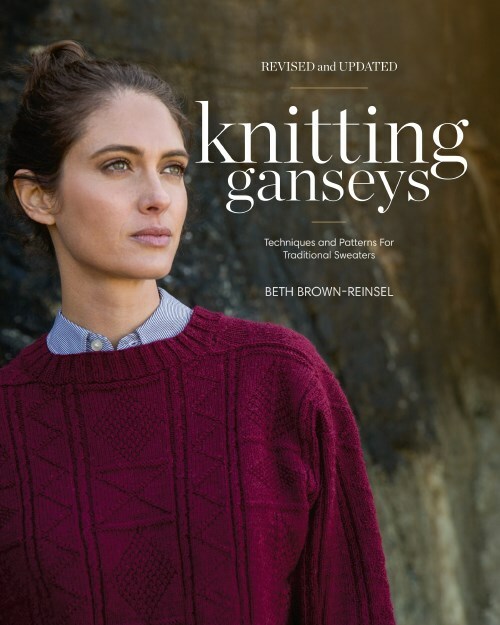 I will not pretend to be entirely impartial when it comes to Beth Brown-Reinsel’s Knitting Ganseys (Interweave Press). It was one of the first knitting books that I bought. She was one of the first knitting teachers I sought out. I arrived in her classroom at Stitches Midwest with my copy in hand, and asked if she would autograph it. She said yes, of course. “What name shall I write?” she asked. Oddly, she did not throw me out of the class; and we remain on a cordial footing to this day. As fiber arts publishing continues to search for a way forward in a changing market, some houses are reintroducing classics (Elizabeth Zimmermann’s Knitting Workshop, Tudor Roses, The Vogue Knitting Book, et al.) 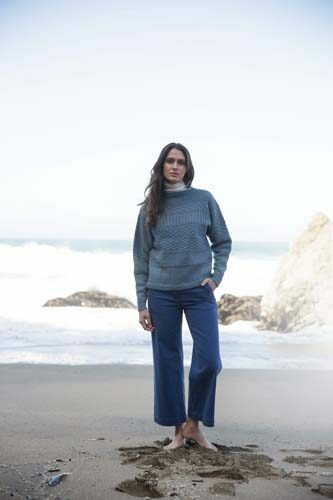 in fresh formats, and Knitting Ganseys is one of the latest. I have my original (autographed!) copy and the new edition side-by-side here on my desk. Guess which one is the new edition. Go ahead, guess. Before you even open the book, you’ve got a hard cover, a larger format, and more subtle photography. And the cover doesn’t lie. What’s inside is equally transformed. 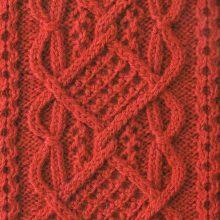 One of the strengths of the original Knitting Ganseys was its basis in Brown-Reinsel’s real-world teaching. When preparing an educational book, no amount of theory compares to the first-hand experience of students in a classroom: what questions they ask, where they often falter or fail, what information is vital, and what information may be set aside. Since the first edition, Brown-Reinsel has continued to present her curriculum to what must, at this point, be thousands of knitters. This cannot help but improve the material, and those improvements are evident everywhere. The historical preamble covering the known history of the gansey (or guernsey, or jersey, or knit-frock) is notably expanded. New descriptions and photographs of the traditional tools (knitting wires, belts, and sticks) show the relationship of the tools to the method, and the method to the garment. The history itself has been corrected and updated to reflect research and discoveries since the early 1990s, and the new format includes more and better (not to mention better printed) photographs of long-ago gansey knitters and their work. Then comes the heart of the book, in which the process of designing and knitting a traditional example are laid out in (thank you, Beth) the logical order in which a knitter considers and executes them. Here, the author has her work cut out for her. 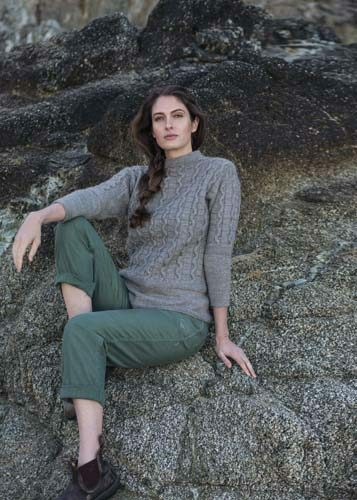 Too often, accounts of “traditional” or “folk” knitting reduce a signature garment to a mere formula, giving the false impression that knitters in a living tradition take what is handed to them and reproduce it, without variation or question, for generations. This is sometimes due to the author’s lack of knowledge, an editor’s heavy hand, or simply the number of pages available. 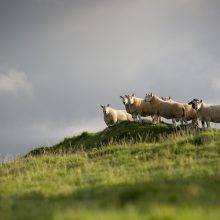 But it’s unfortunate, wherever it happens, because it distorts the important truth that our knitting ancestors were, as we are, human beings working with simple tools to make beautiful and useful things. They had different needs, tastes, and skill levels. They thought about their knitting, they innovated, they picked up and discarded methods as it suited them. 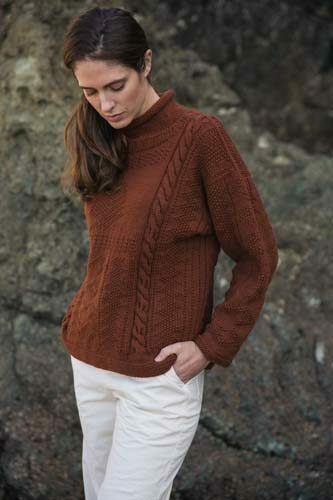 One of the triumphs of Knitting Ganseys is that Brown-Reinsel faces the sheer variety of what you can knit and still call a “traditional gansey” without flinching, and without turning her book into a bewildering, overgrown hedge maze of options. There are different (and historically accurate) approaches to the hem, the neckline, and everything in between. With the confidence of a woman who knows what she is talking about because she has been talking about it for decades, the author lays out the options for each step. Do this, and you get this. Do that, and you get that. No fuss, and not one scrap of unnecessary information. Choose your own adventure, keep calm, and know that they all end in a pretty cool piece of knitting. Running through the book are the stage-by-stage instructions for testing the waters by knitting a small (very small, mine fits a svelte guinea pig) version of a gansey that includes patterning, underarm gussets, shoulder straps, and a neckline. These are based on her classroom curriculum, and they work. In fact, they work so well that I’ve recommended this book to new knitters who just want to get a feel for knitting a sweater, any sweater, before they cast on a full-size project. Even if you never actually knit a complete gansey, a few hours spent working through the miniature can change the way you knit. I found myself so taken with the tiny versions of the underarm gussets, and how much they improve the flexibility of a piece of activewear, that I’ve used them in at least ten non-gansey sweaters–particularly those intended for the toddler-to-teenager cohort. So far as I can tell, every page of the original edition has been reconsidered. That includes the line-up of patterns, expanded from six patterns to nine. Only the two greatest hits of the original (“Musician,” adapted from “Muted Musician,” and “Grace’s Cardigan”) are present. The other seven are new and beautiful, often playing with the traditional shape, fit, and silhouette in clever ways. I mentioned the photograph on the cover, and it’s worth noting that not only the cover but the entire book has been handsomely re-photographed by David Baum and George Boe. 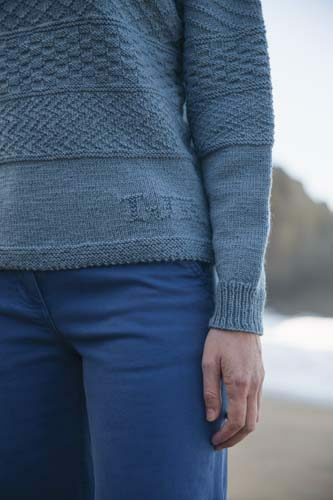 Their work shines not only in the romantic seaside shots of the finished garments, but also in the crystal-clear step-by-step photographs and the close-ups of the texture patterns that are the hallmark of gansey knitting. Also new: the charts, the schematics, and the diagrams, and the entire layout. Without wishing to denigrate the excellent work of the original team, these are a step forward in both beauty and legibility. 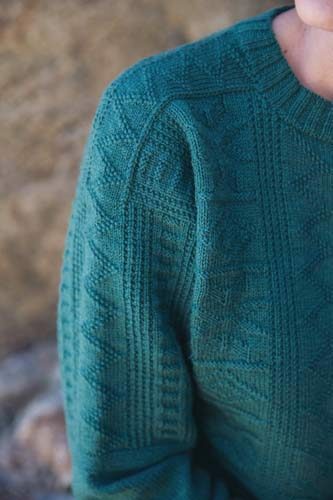 Knitting Ganseys has been on my personal knitting bookshelf for longer than almost any other book, yet this edition has made me see it with new eyes. It’s comforting to know it’s still here to inspire another generation of knitters. Photographs by David Baum and George Boe. A Franklin Habit Book Review Is a Joy to Read. These sweaters are beautiful! I am about to start knitting my first sweater after years of making hats and other small things. I love the idea of knitting a tiny sweater first. I will be buying this book. Pat, making a small sweater is a great way to prepare for knitting your first adult-sized one! Especially if you are like me & need to DO to fully understand a pattern. I knit my first sweater (newborn-sized raglan cardigan) about 8 months after I taught myself to knit, and it helped me understand basic sweater construction and not be intimidated about making adult-sized sweaters. The original version was one of my first knitting books too. Knitting the tiny sample was perfect. 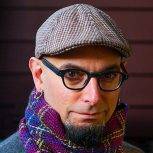 I’m sure it’s why I am able to think “I will knit that but with a different collar” without qualms. I framed my miniature sweater I made in one of Beth’s classes and right now I’m in the middle of completing a friend’s gansey. Her teaching style is clear, concise and supportive. I definitely need this updated version. 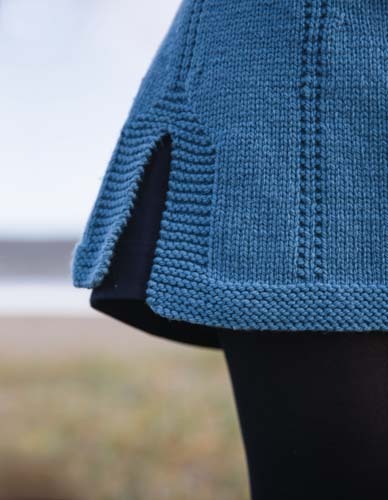 What I remember most about the original _Knitting Ganseys_ is the appeal (as well as the utility) of knitting that miniature sample gansey. I have very clear memories of being at work, looking forward all day to continuing that juicy, rewarding project when I got home. Talk about sparking joy! 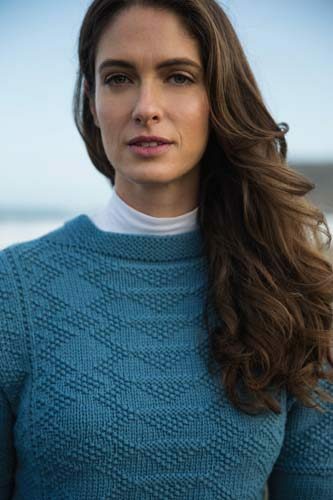 BTW, it shares that distinction with Jacquiline Fee’s 1983 book, _The Sweater Workshop_, which also walked this knitter calmly and undramatically through a plethora of techniques via knitting a quirky sampler. As a result of having had that experience early on, I never learned, for example, to dread the Kitchener stitch. Those two books, along with the original 1987 _Homespun, Handknit_ (wherein I learned to knit socks by making the Wee Sock at the end of the book and then proceeded to make my kids huge Christmas stockings out of dimestore acrylic), were my pre-internet knitting lifelines. I forgot that I owned the original when I bought the updated version (autographed!!!). But I wouldn’t part with either one! I bought the revised version when it came out, read through it then put it away. Your excellent review pointed out several areas in the book my cursory reading failed to retain, and I now want to go back and delve deeper, perhaps knitting one of those miniature sweaters. Thank you for your perceptive and thorough discussion of the book’s merits. I also have a copy of the original book, which I had autographed! 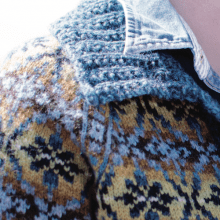 I attended a class of hers on knitting Norwegian Mittens about 10 years ago, and brought along my miniature sweater I had knit from the Gansey book. I found knitting the mini was a great way to learn, ripping back a mistake in something small is not devastating! Well, I have just updated my Amazon wishlist. Now I have to make some room in my bookcase. These books sound amazing! I already have the new version of Vogue Knitting, but there is always room for more. Honestly, I think I spend more time reading about knitting and looking at patterns than actually knitting. I need to change that! Either way, it’s fascinating. I groan softly to myself every time I see we have a book note from Franklin. I know I’m about to add to my book stash (which rivals my yarn stash). Then I plow right in to see what I’m going to acquire this time. Luckily for me, I already have this one. However (actually, also luckily for me), Tudor Roses has slotted itself near the top of that “To Acquire List”. Hugs to Franklin. A hardcover format makes it difficult to use but I will perhaps check it out from the library. for the information The problem with books is that I would only ever use one or two at the most, which makes those patterns very expensive. I’ve found that there are so many patterns you can buy separately that buying a book is almost always not the best option. This is so much more than a collection of a few patterns. Really. Franklin, not only is this an informative an intriguing review, it also is beautifully written. I have had the recent pleasure to take her Gansey class and I can testify that she knows her stuff and is a wonderful teacher to boot. This book is worth every penny even if all you do is knit the wee sample sweater. I took her Gansey class years ago at a weaving conference. She’s a wonderful instructor. I learned to make cables and tried the three needle bind off. Great techniques to know. I guess it’s time for me to replace her original book with the updated version. I would like to see the mini gansey, perhaps modeled by a svelte guinea pig. Loved the article Franklin! I love Beth and her teaching style. She is so patient, helpful and encouraging. I have been to 2 of her Vermont retreats. I got my own signed copy of the new Gansey book at last fall’s retreat. Thanks for the review! Excellent coverage, as usual. Since you mention Elizabeth Zimmerman’s Knitting Workshop, which version do you recommend the original or the revised version?